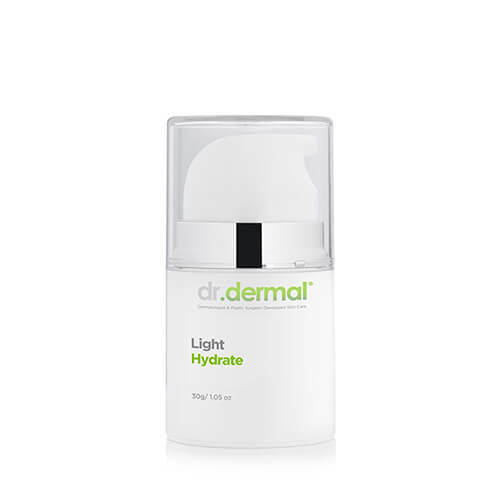 A rapidly absorbed lightweight moisturizer that provides long lasting hydration. Perfect for sensitive or problematic skin. The perfect moisturizer for acne prone or congested skins. With no mineral oils or large molecular lipids that suffocate the skin, it absorbs without a trace while delivering hydration and comfort to even sensitive skins. The ideal moisturizer for clients who prefer lighter formulations. I use this light moisturiser day and night. I love the texture and smell. It finishes off my routine perfectly, sealing in the serum. It’s also a great base for my makeup. My daily moisturizer. Very light but nourishing formula. Doesn’t cause any shine. Great to wear under makeup. I love mixing it with my Dr Dermal serums as well. Apply directly after cleansing and drying skin, or after applying serum. Purified Water, Isopropyl Myristate, Cyclomethicone, Olivem 1000, Cetyl Alcohol, Caprylic / Capric Triglyceride, Potato Starch Modified, Glycine Betaine (Beta Vulgaris (Beet)) Sugar Extract, Nylon-12, Nikkomulese-41, Sensolene, Shea Butter, Sodium Hyaluronate, Panthenol, Phenoxyethanol, Ethylhexylglycerin, Lavendula Angustifolia (Lavender) Flower Oil, Cedrus Atlanticus (Atlas Cedar) Leaf Oil, Pelargonium Graveolens (Geranium) Leaf Oil, Cirus Paradisii (Grapefruit) Peel Oil, Citrus Aurantium Var. Amara (Petitgrain) Leaf Oil, Cananga Odorata Var. Genuana (Ylang Ylang) Flower Oil, Steam Distilled Citrus Sinensis (Orange Blood) Peel Oil, Abies Sibericus (Fir Silver) Needle Oil, Citrus Deliciosa (Mandarin) Peel Oil, Cymbopogon Martinii (Palma Rosa) Grass Oil, Anthenis Nobilis (Chamomile Roman) Flower Oil, Matricaria Recutita (Chamomile German) Oil. Q: Does this product contain petro based chemicals? A: No, this product is manufactured using lipids of plant origin. Q: Does this product contain petroleum jelly? A: No, this product has a base of naturally derived lipids, butters and waxes of plant origin. Q: Does this product contain any parabens? A: No, all of dr.dermal’s products are proudly paraben free. For external use only. Do not use on broken skin. Keep away from eyes and mucosa. If contact occurs, rinse with water. If irritation, redness or itching occurs reduce frequency of use. If symptoms persist, discontinue use. Keep out of reach of children. Store away from heat and direct sunlight. dr.dermal is an award-winning range developed by a passionate team of skin care professionals.